I'll take both requests in, @Ahhh Girl. They probably won't be ready today, but I'll post them. 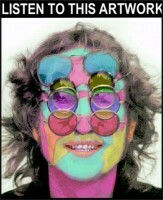 I want to see the picture of John with all those sunglasses from Walls And Bridges . Say, while we're on the topic of requests, what about a doodle of the Exis? I think that'd be really cool (of course, only if you'd like to. And don't stress about doing it right away, you've got plenty of requests already!). *a new nickname I came up with recently, do you like it? AAAAH! It's All Too Much FOR ME TO TAKE!!! Only joking. I will try to remember these requests, and I will post them over time, if any of you don't mind. I might choose one to draw today even. Also, great nickname, @WeepingAtlasCedars! Here is Klaus in all his Revolver -y glory, @WeepingAtlasCedars! I used a different app for this drawing. I tried drawing all three, but I got stuck and cropped it down to this. Perhaps I will try and draw Astrid and Jürgen again and connect them to this drawing if I find the correct pictures. 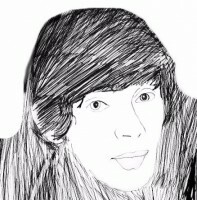 What a lovely drawing, PeppyPuppy! Wow, you captured his expression perfectly! I've never been able to draw faces that well. I'm right excited for the other ones. I'm sorry I haven't completed any other drawing requests yet, but I've been extremely lazy all since this holiday began. 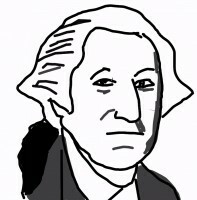 @Ahhh Girl, George Washington is on its way next! I would highly appreciate any feedback and suggestions to improve the article if needed. I think that's a pretty nicely written article, PeppyPuppy. I don't see anything that seems to need improvement, though I'm not a huge Stones fan myself, and I don't know an overwhelming amount about them. Good work, anyways! ^^^ That article you mentioned was quite an interesting read. I would have never thought of John ever supporting rap music to that extent. Hey SPB. Could you make an art (or fart) of me for a new avatar? I based it a little off of the Richard Avedon pictures. Hope you like it! @Ahhh Girl George Washington for you! I think I shall do @sir walter raleigh 's request of John with the glasses next, and Stu afterwards. I cannot tell a lie. Very nice! Nice Necko there, it's like a mix of psychedelia and The Simpsons. So the Necko art was based off of the Richard Avedon photos! I'll say, you did an incredible job PeppyPuppy, because that's the first thing I thought of when I saw it! Edit: forgot the S in SPB's username, drats! Wow, you really burst with creativity at the moment @SgtPeppersBulldog! So many different techniques and all of them are amazing! 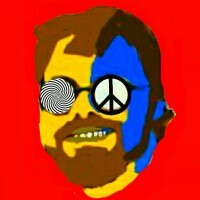 Necko's new avatar and the picture of John are both awesome. Keep up the good work!